Our Mission - The Board of County Commissioners provides responsive and accountable services to protect and enhance the Flathead community. Adopted by the Employees of Flathead County and the Board of County Commissioners. 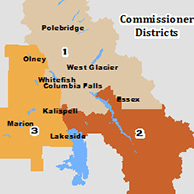 All public hearings take place in the Commissioners' Chambers, located on the third floor of the County Courthouse at 800 South Main in Kalispell, MT. Note: Scheduled items are subject to change. Check the Commissioners' Agenda for more information. To automatically receive information about bids, please send a written request with your address and a brief summary of the goods or services that your organization provides to malbertson@flathead.mt.gov or via FAX to (406) 758-5861. Make in difference in our community by volunteering! Thank you for your interest in serving our community! All positions are appointed by the Board of County Commissioners. Please call (406) 758-5537 or email malbertson@flathead.mt.gov for more information. Click here to learn more about how you can be involved in local government!